Let’s work together to build momentum, enthusiasm and a thriving audience around your work. Beat down that constant feeling of overwhelm, stop wasting time, and quickly identify where to focus your efforts for maximum results? Gain new and meaningful connections that expand your reach and grow your readership? Share your stories in a way that immediately ignite and inspire your audience? Create unstoppable momentum that builds with each email you send, each post you publish and each book you release? Get your work into the hands of the people that it will matter to most? Looking for help on a specific project or problem? 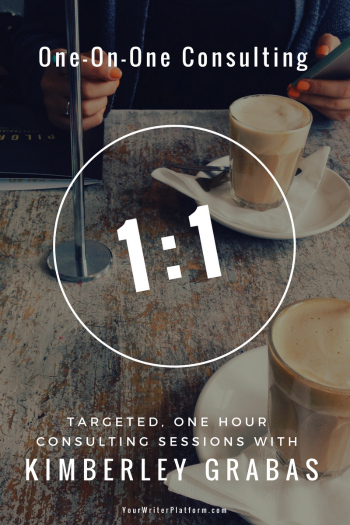 I have limited spots available for targeted, one hour consulting sessions to help you discover strategies and resources to work through your specific problem. Because spots are limited, and to ensure that I’m able to help those who need it most, consulting sessions are by application only. If you choose to apply, you will be guided through a series of 15 questions that will help me get to know you and gain a better understanding of your specific needs. I will then review your application, and if accepted, I will contact you with payment info and booking options. I may already have created a blog post or free resource answering your question, that I can easily direct you to (so you can save your money). Your question may be outside my area of expertise, in which case I would refer you to someone who is in a better position to help. You’re too “green”. You have just started considering, maybe, possibly you’d like to try this writing thing, and you haven’t yet formed even a basic plan of action. If this is you, one-on-one consulting is not a good option. A little research (on this site and others), and some soul searching is required first. Thank you very much for your guidance and advice. Your session was packed full of tips and tools that hopefully will help me progress to the next level in regards to building my platform. I am very happy with the idea we came up with regards to the book launch and the series that will entice the readers to join in and hopefully buy the book. That’s exciting! 1 hour Skype/phone consulting tailored to your specific situation based on your completed questionnaire. My notes (PDF) based on our discussion and any additional research and resources that I recommend. 2 email follow ups to get all of your questions answered. Ready to get started? You can click the button below to apply. Kimberley did a fantastic job with my platform evaluation. She not only answered all my questions and told me what I needed to do, but why. When appropriate, she gave me options, leaving the decision up to me. She shared her expertise in such a way that I felt empowered and gained a clearer understanding of how to get my platform where I needed it to be. Her evaluation was thorough, easy to understand, and well worth the investment. Five stars. I am currently booking speaking engagements and interviews for 2018. 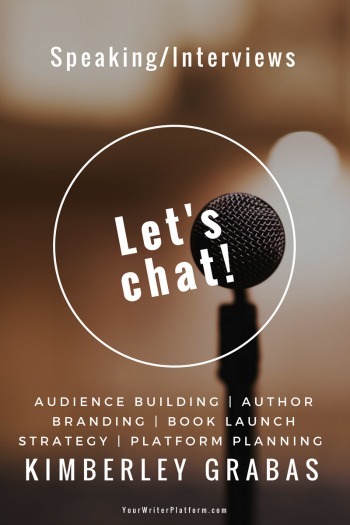 If you would like to book me for an event or interview, please contact me directly at Kim -at- YourWriterPlatform.com so that we can discuss your requirements. Kimberley’s consultation was very informative and personalized. After reviewing my online presence and publishing goals, she walked me through the launch process, stressing the importance of developing a cohesive brand. Everything came together and, as a result, I am in a better position to begin assembling an effective writer’s platform and launch plan. This site is chock-full of tips, inspiration and useful resources to help you build an audience around your work. But sometimes it can be overwhelming to read post after post, and not have a clear roadmap of how everything fits together. So what I’ve done is created some additional guides and resources that will help you hone in on specific areas of your platform, to help you achieve the results you want, faster. Growing a successful platform (and writing career) is confusing and unbearably frustrating when you don’t have the right tools. It seems as though everyone else knows the secret to success, while you’re still stumbling in the dark. But a big part of why some people “make it big” is that they are willing to invest in themselves and their business. There is no need to re-invent the wheel. There is a community of authors and subject-matter experts who are interested in finding new ways to sell more books through creative and proven marketing techniques. 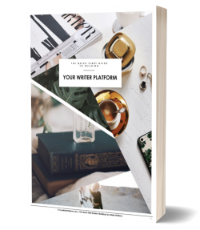 Your Writer Platform is a part of that, and I’m committed to providing you with courses and in-depth training that will ease your struggle and smooth your path. If you have any questions, or would like to discuss further how we may work together, contact me here.